1. The old frame Free Will Church on North East corner of East Liberty Street was first a Universalist Church. The Old Free Church was built by Universalist preacher called Rev.Tarbell in 1846. The Universalist Church couldn’t afford to finish it, so they sold it to United Brethren who then sold it to an abolitionist organization of the Congregational Church ‘Free Church of Medina’. A private school in Old Free Church was taught by Alfred Watters in 1849. Judge Barnard’s school was in basement of Old Free Church in 1858. It was a Free Church until 1860. 1. W. L. Stoaks rented a cottage (house) two lots west to Horn and Andrew in 1874, now #108 East Liberty Street on North Public Square. 1. Stoaks and Bergey Wagon Company became Horn and Andrew Wagons here in 1875. 1. O. B. Dealing sells buggies in rooms formerly occupied by the Medina Fire Department. 1. Dr. Bean's Office next to old Free Church (Now #101 North Public Square). 1. Gunkelman did wood work, Herthneck was the blacksmith, H.F. Handy was the painter and Tom Stoakes did the trimming. 3. Chief among the output of this business is the “Gunkelman Gear” for use on top vehicles and road wagons of all kinds. This celebrated gear is the invention of Mr. Gunkelman and is covered by two patents first issued in 1890 and the latter in 1892. 4. These gears are made of the best of spring steel and are guaranteed in all vehicles. There are 6000 now in use on every style of buggy or wagon. 1. 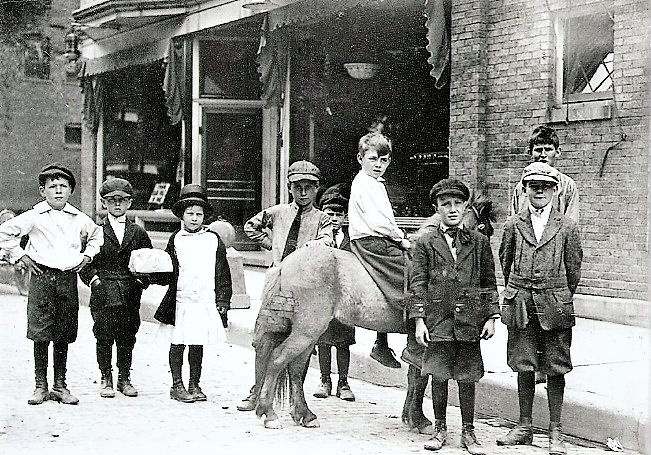 Wells bought the #100 Gunkleman Block at the corner of North Broadway and Public Square opposite the Congregational Church and did exterior repairs on 2nd floor, carriages, horse shoeing, look for the big wheel in 1904. E. D. Wells retired from carriage sales in 1909. 1. They moved in 1907 to new Sylvester Library Building at 210 South Broadway Street. 2. Medina Library Association sold lot #82 with a little frame building on the north side of the Public Square with 19’ frontage occupied by the library until 1907. They sold it to Fred M. Branch for $1500. 3. Edward D. Wells sold the Old Free Church and the old public library buildings (#101-102) to Fred M. Branch (the casket maker) for $875 in 1910. 5. A large frame building on Northeast corner for rent by Fred M. Branch in 1910. 6. Fred. M. Branch left Medina in 1915. 1. William E. Bowman rented from F.M. Branch the Old Free Will Church building. at the northeast corner of the Square and will remodel it for an Overland automobile garage in 1912. 1. Rented the ground floor of the Old Free Will Church building at the northeast corner of the square and will establish a business dealing in hay and grain in 1911. 2. Fred M. Branch and Henry Gardner working with architect and contractor for a new Opera house on the Branch lot on the north side of Public Square just west of the Congregational Church in 1912. 3. O. I. Shaw razed the old Free Will Church and 2 frame buildings for new theater in 1913. 4. Architect William Clark of Pittsburgh says old frame buildings will be covered with brick veneer to form part of the new Princess Theater Company in 1913. 2. Theatre had a small balcony. 3. John Beck was the Princess Theatre organist in Princess Theater Block from 1913 to 1915. 4. It became the Shine’s Princess Theatre, with W. Henry Gardner and Fred. M. Branch as new managers in 1914. 4a. 1918-The Princess theater resumed movies last Saturday evening after a two weeks shutdown. Henry Gardner will have the management for the next six months, succeeding his partner, Fred M. Branch of Lakewood, who has had it during the spring and summer. 5. W. Henry Gardner sold the building to Ben Yudelevitz and George Willis who had been leasing it in 1924. Ben Yudelevitz operated the theater for 25 years. 6. A fine new canopy name was put on three sides in 1929. 7. Vitaphone speaking movies were installed in 1929, 1st town its size to get one, plus new seats and decorating, drapes in 1929. 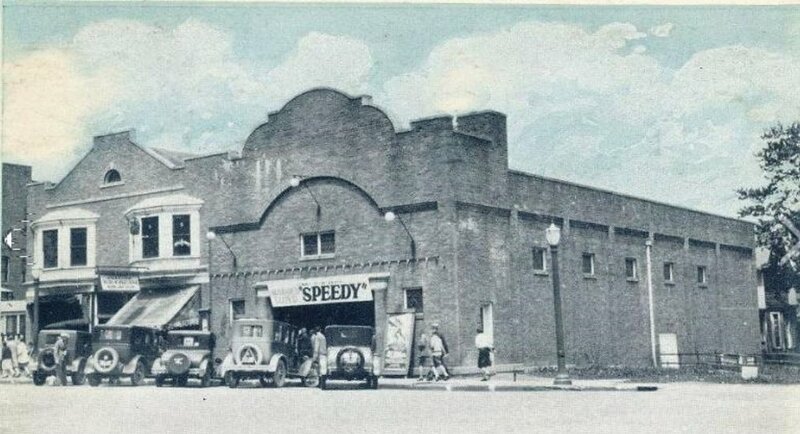 Princess Theatre in 1930 remodeled and $1000 fireproof insulation added in 1934. 8. Drapes and a new Thermax ceiling added to Princess Theatre to add to the sound feature of modern film and also toilet rooms and lounges added in 1934. 9. A new neon sign over the theatre marquee in 1936 and theatre remodeled in 1937 with new seats and a sound system. 10. Gazette Article Dec 31, 1937; Princess Theater now Shine’s Princess Theater. Shine-Medina is part of a chain of 100 theatres operated by Willis and Yudelitz in 1937. 11. Theatre called “The House of the Good Talkie” in 1937. 1. Theater closed from 1938-1943 due to WWII and reopened with Western movies on Saturday and Sunday, with Fred Lentz as Manager in 1943. 2. The Princess Theater closed in 1950 and the Marquee was removed in 1951. 1. Church of the Nazarene moved to Princess Theatre in 1943. 2. Entrance to the Church was located on the North Broadway Street side of the Princess Block. 1. Old Princess Theater was a theater for 40 years and was sold to Ohio Fuel Gas a for show room in 1953. 2. Building remodeled and a new entire front of glass for $50,000 in 1953. Added display cases designed by company engineers and made by W. R. Clark and Son of Medina for air conditioning, a dream display kitchen and cooking demo area, tile and brick walls, wall ovens, kitchen fireplace, and countertop ranges. 1. Ohio Fuel Gas Company name changed to Columbia Gas Company of Ohio. 1. Natural gas was first piped into Medina by Medina Fuel and Gas in 1911. 1. Opens photo gallery in rooms vacated by Earl Funk restauranteur. 2. Rozell will also engage in amateur Kodak finishing. 1. Princess Frock Shop remodeled with Perma-stone front in 1947. 1. A thrift and consignment store featuring brand new and upscale consignment women’s, children’s and men’s apparel and accessories. 2. Cherish Derrig has been in Medina for many years and has been a photographer with her own business for 15 years. Harry. W. Codding sold his insurance business in Princess Block to Wayland A. Hyde in 1922. In 1925, the Strout Farm Agency was divided into two separate Agencies with Wayland A. Hyde and Foice Bagley working the insurance business and Reuben J. Hyde and William Wheeler handling the real estate business sharing offices in the Princess Block's second floor. 1. David D. Porter, Attorney moved into the Burnham house 1929-1931. 1. Elmer Zarney Commercial Art Studio in room vacated by Dowell, Inc. in 1955. 1. Doherty is in with Medina Gas and Fuel for now in 1922. B. Fretz the sold buildings and sheds on Lots 83 and 84 east of the Savings Deposit Bank in 1899. 2. W. H. Alden was born in Suffield, Connecticut, May 15, 1805. When he was 18 years of age he accepted a position as clerk in a mercantile house in Hartford, the capital of the state. In 1831, he came out to Ohio, settling in Medina. On January 25, 1834, he was married to Sarah Smith, a native of Suffolk County New York. A year later he changed his residence to Seville, where he engaged in mercantile business to public office and then he again moved to Medina, and he resided here up to the time of his death. 3. As early as 1840 he was elected sheriff of Medina County, holding the office two terms, and at its expiration he was elected county auditor, also holding that office for two consecutive terms. In the fall of 1853 he was the lead one of the justices of the peace for Medina Township, and he held that office continuously until 1886, when on account of failing health he was compelled to decline a re-election. During the years from 1863 till 1871 he also served as an assistant revenue assessor in the district. 5. Daughter Susan King Alden owned and rented the Alden homestead until 1916, when she was 75. 1. William H. Alden house added a new front porch in 1886, when it was moved to this location. 2. A fire at the Alden house caused minor damage in 1912. 1. Rozell occupied the frame 1-story house with porch along front left side. 2. Willard G. Rozell was a photographer, sign painter and operated the projector at the Princess Theatre. 3. Larry D. Newberry has laundry office in Rozell studio in 1910. 1. Winyah Club opened new home in Alden House in 1916. 1. Alden Homestead on the North side of the square that has been occupied by the Winyah club will be renovated and occupied by the Rev and Mrs. S. F. Dimmock. 2. Mayor Rev. S. F. Dimmock keeps chicken here behind a 15’ fence. 1. In 1919, the American Legion purchased the Alden property on the north side of the square for $10,000 for their community house. 1. Alden house moved to the rear of the lot in 1921 and cellar left full of water and condemned in 1922. 1. Ohio Fuel Gas owns the vacant lot. 1. The rented Alden house between the Princess Block and the Telephone building vacated by John Williamson was sold to Vernon Horton who will have the restaurant in 1928. 1. Ohio Fuel Gas Company sold the vacant lot to Vernon Horton and Horton had a dining car structure installed in 1928. The Simmerman family that owned the Buckeye Diner from 1939-1945 are pictured in 1947 in front of the new Buckeye Diner and Dining Room; Thelma Simmerman, Frank Simmerman, Mother and owner, Fanny Ferne Simmerman, George Wilson, and Isabelle Simmerman Wilson. Co-owner, George Simmerman died in 1938. 1. In 1935, George Simmerman purchased the Buckeye Diner from Vernon Horton while also retaining his partnership in Park Drug Store with H. H. Bachtell in the Phoenix Block. 2. His wife, Fanny Ferne will manage the operation of the restaurant. 1. George Simmerman died in 1939 and Fanny and the family took over the management of the restaurant. 2. The Simmerman family sold the Buckeye Diner to Margaret and Joseph E. Nagy from Chippewa Lake in 1945. 1. In 1947, the Nagy’s added a large dining room on the west-side of the dining car. 3. Joseph Nagy sold Buckeye Diner to Herman Hale in 1955. 1. Hales Restaurant replaces the Alden House and the Buckeye Diner formerly on City Lot 83, at 108 East Liberty Street. 2. The new Hale Restaurant built by contractors Gay Simmons and Sons in 1956, is a one story Colonial white brick front, 30’x100’ with three dining rooms that seat 150 people. 3. Restaurant was air conditioned in 1957. 1. Jones excavated basement, added an addition to rear and now the Restaurant now seats 210 in 1960. 2. The Private Alden Room and the Pioneer Room were added in 1963 and 1974. 1. Howard Asher filed bankruptcy in 1984. 1. Restaurant sold to Norman Lehrer in 1985. 2. Still has a round table in front room for community leaders to eat together in 1985.